Please accept my greetings. I am thankful to you for your granting me an interview and accepting a few copies of my paper "Back to Godhead" which you have promised to go through at your leisure hours. And on reading the paper, I hope, you may be able to make an estimate of my mission in the matter of the Bhagwat Gita. I heard it through reliable sources that you are a great admirer of the Bhagwat Gita and your Vidyalaya has a special department for preaching its philosophy. I came to Bombay from Vrindavan to co-operate with you, because there is no difference between the missions of both yourself and myself. I also attended your meeting of the 16th instant on the subject of " What is the matter with the world?" I was very glad to know your opinion about it and so far I remember that you concluded to go back to Godhead which only can save the world from a disaster of civilization. 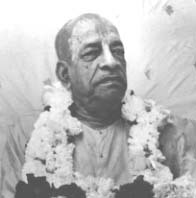 who therefore consider God and living beings are identical in every respect, are polluted in thought. This pollution of thought of the empiric and atheistic philosophers now prevailing practically all over this world, has caused a tremendous deterioration of human civilization as to become agnostics in dealings. Symptoms of this agnostic trend of human civilization is described in the 16th chapter of the Bhagwat Gita and I need not describe it to you. Therefore the preaching of the Bhagwat Gita must be in line of its parampara system as it is described in the 4th chapter of the book. If it is not done so, then such preaching of the Bhagwat Gita, even if it is done by the erudite scholars, will be a sheer waste of time, energy and money. I wish, therefore, that you may co-operate with me in giving the idea an effective shape. In this connection, I would like to draw your attention particularly to my papers (issue No.XI) "An essential service" and (Issue No.X) "Sri Krishna the Supreme Vedantist." In this connection, I have already made an association registered, of which a short description is given on the 4th page of the issue No.X which, I hope, you will kindly note. Some friend asked me to join your institution for preaching the cult of Bhagawat Gita; but if you find it difficult to accept my service, then I shall go on organising my society separately. And if you advise me to do so separately, then I would request you to become a formal member of the League personally. I hope you will not take my offering in an inferior complex but accept it in the spirit of love for the Bhagwat Gita. Om Tat Sat. As I have been engaged in speaking of the Bhagwat Gita in your 'Bhavan' for a few days, you may kindly send me the reply to the address given on the top of the first page.